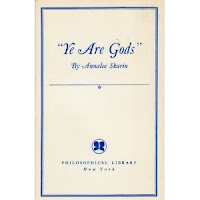 Having just read a chapter from Annalee Skarin's Ye Are Gods, I wanted to share a few quotes that really impacted me. Shortly thereafter she explains that someday, we will not only deal with the symbols, but the reality of what they represent. And that reality is based upon matter, which is vibrations. Those vibrations are based upon "the force of thought or intelligence that created the thought originally". (p.145) I love how clearly this was explained. This chapter digs deep into a vast array of related topics, but the biggest is that in the Greek version of the Bible, the word "devil" is translated to mean "accuser". (p. 148) Time and time again, this is a tactic that the "accuser" uses to befall us. Are there any who are immune to this sin? Who have not been critical or unjustly accused another at some point in their lives? "Lip prayers have no meaning, send out no vibrations, and are wasted. Love is the ruling power in the realms of eternal light. Love is the most powerful vibration that can possibly be released from a human heart. Love is allied with joy and happiness and light –thus to love God and our fellowmen fulfills all the laws and truly keeps all the commandments. It casts out fear. It casts out hate, jealousy, pride and prejudice. It conquers darkness, ignorance, discord, disease and holds the keys of eternal happiness here and forever more.